The Fujifilm X Pro1 compact system camera has beaten some full-frame cameras including the Canon EOS 5D Mark II in our lab testing. When the X Pro1 was announced back in January, a ripple of disbelief spread around the globe after Fuji claimed that its APS-C sized sensor was capable of producing better results than full-frame rivals. It does this by arranging the colour filters in a way that allows for the low-pass filter to be removed. Naturally, we were very excited to receive the camera so we could put it through our rigorous testing to see if it managed to live up to the hype. We are extremely pleased to report that the X Pro1 doesn't disappoint. 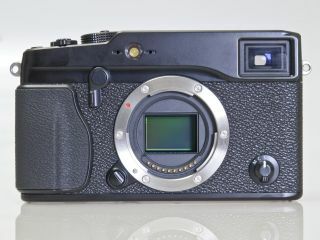 Our analysis pitted the camera against the Leica M9, Canon EOS 5D Mark II and Nikon D700. Shot using the Fujinon XF60mm f/2.4 Macro lens, it was only the 5D Mark II that had a better signal to noise ratio result for raw files. We've also been out shooting real world images with the X Pro1, and again we are pleased with the initial results. We will be putting the camera through even more extensive testing over the coming days, to bring you a full in-depth analysis, in the meantime you can read our Hands On: Fuji X Pro1 review to see sample images and check out the labs data. As soon as we are able we will compare the X-Pro1 with the latest generation of full-frame cameras including the Canon 5D Mark III and Nikon D800.